At the time of writing this wine can be bought in Lidls for 10€. Not 10€ each of course, 10€ for six bottles, with a free corkscrew thrown in. Corkscrews are still used here in Spain where wine is not always drunk the same year as it is laid down. This is marketed as an ordinary wine to be drunk in quantity. In our household at €1.80, it would come in at about fourth bottle in a dinner party at the point where guests’ finer sensibilities had been somewhat blunted, but before they had got into a fight or lost the will to live. At big parties/celebrations it comes middle to late night. What can I say about it? It’s a good dark red and has a reasonable “body”. It’s “soft”. What I mean by this is that it’s not thin and sour like all the French wines I might buy at three times the price. It’s not “jammy” like those “full of fruit” southern hemisphere wines. It’s a “single note” wine, by which I mean – have a sniff, have a sip, drink some and swallow it. No point in embibing aroma or swilling it around your mouth. What you taste is what you get. No point in hanging around, this is not a wine to be savoured. On prima fascie evidence, I would not take this wine as a present to a dinner party unless I actively disliked the hosts, which I often do. You might try a bottle in this category on the sort of host who whisks your bottle away saying he’ll save it for a “special occasion” as though your presence wasn’t special. He’ll then ply you all night with expensive but poor value wine in an attempt to convince you that he “keeps a cellar”. But I digress. . . The wine in question is called “Cinglano” and in deference to John’s comment (see my last post) re the seductive beauty of wine labels, I’ll analyse the back of the bottle so as not to be distracted by the design on the front. At the top right hand corner it says “Crianza ’06”. This simple cypher carries lots of information. This wine costs €1.80 or $2.50 or £1.50 a bottle remember, so it’s very inexpensive and yes I know it’s not cheapness but value that interests us. So let’s consider the value. This is a five-year old wine. A wine must be laid down for five years if it is to become a Grand Reserva. Wines can only be designated “Grand Reserva” if the vintage is also up to scratch and a little research shows us that the year 2006 is indeed a vintage year. So, has the vintner laid it down in the hope or expectation that it might be sold as wine of the highest quality? For some reason the wine didn’t make it to Grand Reserva but has been through all of the processes of elaboration and quality control. The description tells us that its made from the Monastrell grape, made world famous under another name (Mourvede) in France but the French can only just grow it because it needs a Mediterranean climate. It is a Spanish grape, drought resistant, bearing a small black berry with a heavy yeast bloom, which delivers a high tannin punch that mellows with age. 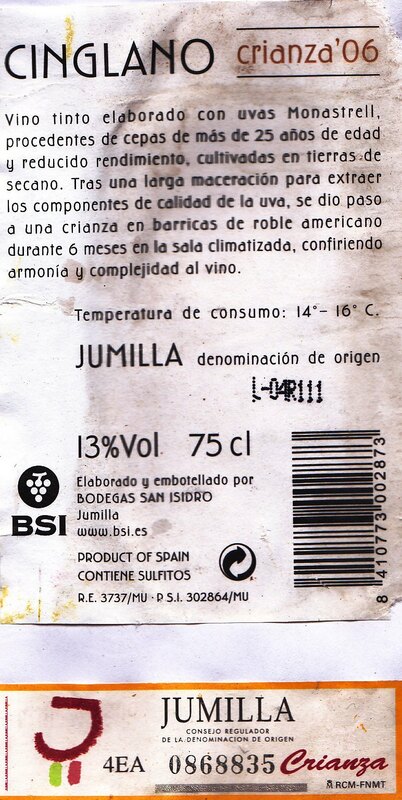 The description on the label says that the wine has been matured in barrels of american oak for 6 months, confirming that it is a “Crianza” – a mark of quality. It must be at least 2 years old plus 6 months in oak for Crianza (18 months for Grand Reserva). Further down the label, the word “Jumilla” denotes a well respected Denominación de Origen situated in the south east of Spain north of Murcia. This D.O. confirms a quality that is reenforced by the additional little D.O. badge beneath the main label. No wine can be a Crianza without being D.O., and this is a special D.O. 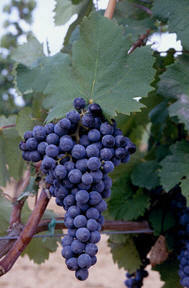 Jumilla itself is a little known jewel of Spanish viticulture. The sandy soil kept down the phylloxera insect that devastated European all vineyards in the 1880’s, so Jumilla now posesses (though it fails to advertise) some of the oldest vines in the world and the largest number of ungrafted Monastrell vines anywhere. On the down side, Cinglano is only 13% by volume, so wouldn’t pass Dad’s alcohol test. And it “contains sulphites”, which apparently do not go down well with those North London winos who like their liver failure to be organic. All in all though, quite a lot of quality. Better not to waste it on dinner parties.